Gwion Davies has posted hundreds of photographs of the 2017 show on our Flickr account found here. ...to member Lance Brock and his partner Ell on the very recent birth of their son David. We wish you all the very best and hope that David is doing well. 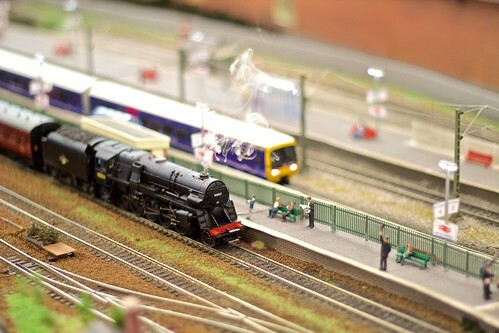 You could of course buy him an early train set at our grand Autumn stock sale Lance. I didn’t say that really. This will take place on Thursday the 26th. October between 7pm and [approx.] 9pm and Friday the 27th. October between Noon [approx.] and 2.30pm. The venue for both will be the old Library on Floor One of the FOYD building. This is not an auction and, consequently, no previewing will be possible: access to the stock can only take place from the times shown above. All stock is sold as seen and does not come with a warranty. However, all locomotives have been tested in advance and can be assumed to be working unless otherwise advised. Stock is priced to take this into account. As always, it is advised that all locos purchased receive a light oiling [bearings, etc] before lengthy running is planned as they may well have been standing in store for a while. We are currently unable to accept cards in payment. In N, locos in BR and GWR outline, including Prairies, Halls and later BR types. There is also some American outline stock including an impressive Atlas ‘C-liner’ type two-car unit with 8 heavy-weight 12-wheel coaches. In HO, a large amount of Athearn and others American freight stock, including reefers, cabooses and tanks, Athearn heavy-weight 12-wheel Pullman coaches, Mehano Mogul and 2-6-2 locos, a Fleischmann German-outline 2-6-2 tank and a DB Class 24 diesel, and a variety of good quality German-outline bogie and 4-wheel coaches. There are also some Rivarossi Santa Fe heavy-weight 12-wheel Pullman coaches. In OO, various Hornby boxed sets including a 4-coach Flying Scotsman set and a DCC Virgin Pendolino set, a rather nice Hornby A4 in LNER silver grey, various LMS and GWR-outline locos including a 2P and a Manor and Hornby LMS, LNER and GWR coaches. So, absolutely something for everybody and, of course, a number of our £1 and 50p bargain boxes containing older wagons, building parts and other spares. You just cannot go wrong! We do not plan to run another event until early-Spring next year so this will be this year’s last chance to benefit from a sale. Early Christmas presents? All in receipt of this newsletter may attend. A brief note to advise that this month’s Friday lunch-time opening will take place on Friday the 27th October [the second day for the stock sale]. I’ve again been asked by John Allnutt to remind all members who wish to attend this event but who have yet to sign up to put their names on the form on the notice board. From Friday the 3rd. November and on following Fridays until further notice, Malcolm Shore will be at the club, working on ‘Kingston’. He will be on site from around 2- 6.30pm and so will open and lock-up for any others who wish either to assist him on ‘Kingston’ or use the other SRMG facilities on the top floor. Should the front door be locked, Malcolm has suggested that he can be telephoned on 07484 172344: he will then let members in. And on the subject of ‘Kingston’, and further to the note in the previous update, please remember that its future is entirely predicated on members’ continuing support. If you model in O gauge [or wish to] and hope to use ‘Kingston’ in the future, or if you just wish to lend a hand with, for example, building scenery etc., please be prepared to be involved in its development. Malcolm has also indicated that there may well be an element of ‘O’ narrow gauge in the final plan [so On30 may be run on part of the system]. A quick note to advise members that K.D.C Models has opened in Ammanford and is selling a full range of stock. The website is www.kdchobbies.co.uk and the address is 50, Saron Road, Saron, Capel Hendre, Ammanford SA18 3LG. This will be e-mailed with the newsletter as a separate attachment. The Thursday rota runs until the end of the year and has already been circulated. A copy is also on the notice-board.